Twelve patients with AZOOR were studied. The diagnosis of AZOOR was based on the results of ophthalmoscopy, Goldmann kinetic perimetry, and multifocal ERGs. In addition, DA and LA perimetry, ERG, and SD-OCT were performed. The patients were followed for 1–9 years. 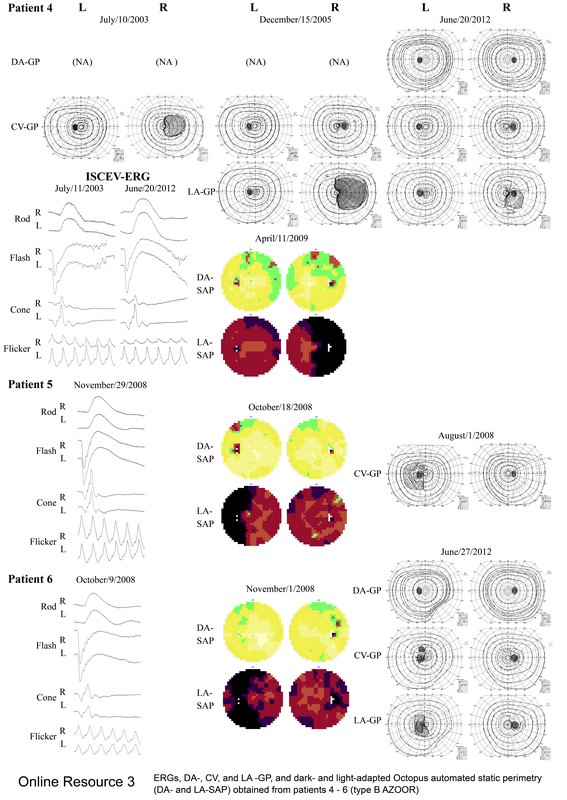 The patients were classified into two types: type A patients (3) had a scotoma detected by both DA and LA perimetry, normal or equally abnormal cone and rod ERGs, atrophy of the outer nuclear layer (ONL), and disruption of the inner segment/outer segment (IS/OS) junction line in the OCT images. Type B patients (7) had a scotoma that was more prominent in LA than in DA perimetry and a continuous IS/OS junction line in the OCT images. Two patients had characteristics of both type A and type B AZOOR. 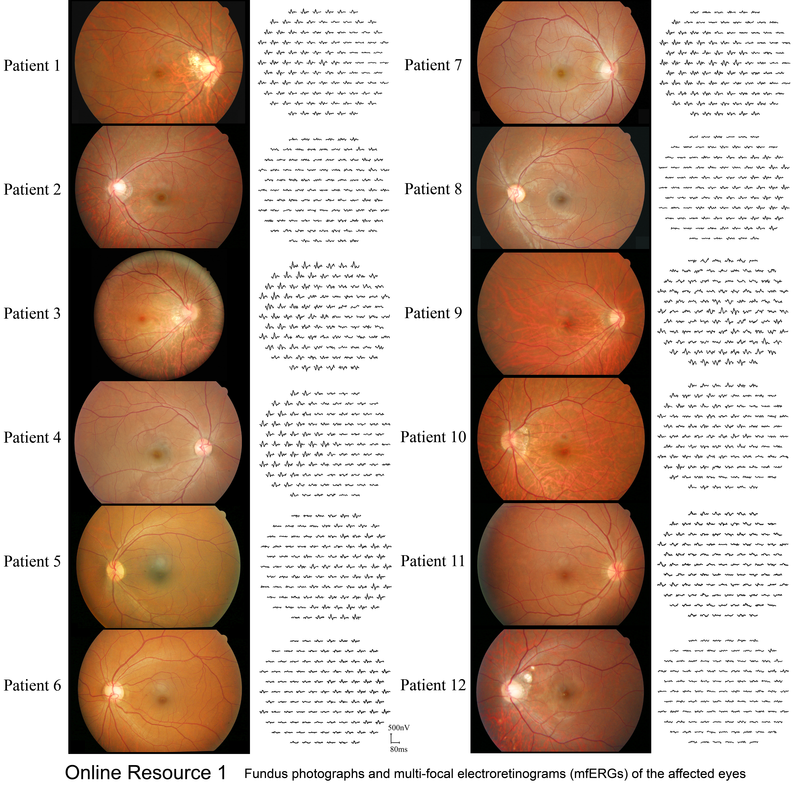 Our findings suggest that eyes with type A AZOOR have focal and severe impairment of both the rods and cones, and eyes with type B AZOOR have focal and specific impairment of the cones. The online version of this article (doi: 10.1007/s10384-013-0297-x) contains supplementary material, which is available to authorized users. 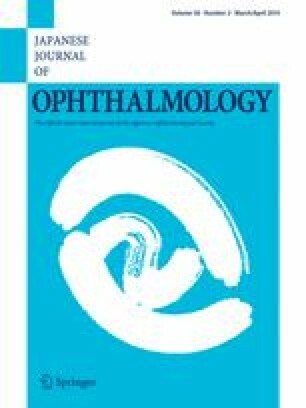 The authors express gratitude to Kazuyo Nakada-Omure, C.O., Department of Ophthalmology, Kinki University Faculty of Medicine, for her continuous technical assistance, especially for performing the dark- and light-adapted Goldmann kinetic perimetry for this research. This research was supported in part by research grants from the Japanese Ministry of Health, Labor, and Welfare, and from the Japan Society for the Promotion of Science. K. Kuniyoshi, None; H. Sakuramoto, None; Y. Nakao, None; C. Matsumoto, None; Y. Shimomura, None.